Last time I checked it was Spring…almost a month into Spring I might add, so do you think we can forget about this sucky weather for a minute and just enjoy a fresh, bean salad? To me, bean salad is the quintessential dish during the warm months because a) it doesn’t require the use of an oven and b) it’s ready in oh, about 5 minutes. It was only last year that I discovered my love for bean salad. I was chatting with a friend of mine on the phone and she was talking about the bean salad she had just made, this got me wondering: Bean Salad? What do you put in a bean salad? Why have I never had one? Has anyone seen my lip balm? Why do people hate on twilight when it’s actually a good movie? 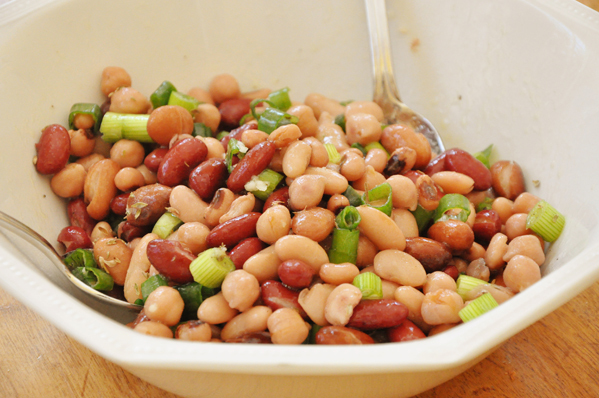 So, I’ll leave you to ponder those questions while making my favourite and easiest bean salad. And like I said, try and forget the fact that just yesterday morning, I woke up to a blizzard outside my house. Mother Nature – figure it out! Drain and rinse bean medley and put the beans in a serving bowl. Slice the green onions. Mix the sliced green onions, crushed garlic and thyme in with the beans. Add oil and vinegar and toss to combine. Season with lots of freshly cracked pepper and a little salt. Enjoy the bean salad and cross your fingers for winter to finally be finished. p.s I don’t actually like Twilight. I made this the other day and I already know I will make it again! I used red wine vinegar instead of balsamic and it was yummy. I especially liked the dried thyme - I never would've thought to add that, but it brightened it up nicely. This salad is even better the second day! Thanks, Sarah! I'm so glad that you enjoyed it - red wine vinegar would be delicious in here as well.